Donald Trump Jr. did not go into detail on what President Trump had advised. Asked last year for details by the BBC, Prime Minister Theresa May said, with an amused expression: "He told me I should sue the EU." In an op-ed published Tuesday in the London-based Telegraph, Donald Trump Jr. said the failure of the country to navigate an exit from the EU by the deadline is an example of how establishment elites try to subvert the will of the people. 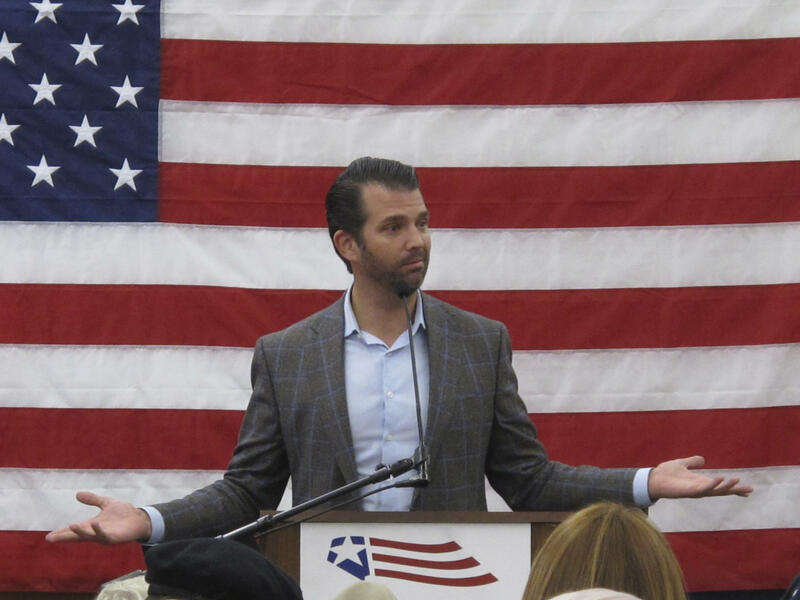 Trump Jr. likened Brexit to the political landscape of the U.S., in which he said Democrats and "deep-state operatives" have been "colluding to subvert the will of the American people." Nearly three years after the U.K. approved Brexit, the details of the planned exit are still in flux. Because May "ignored advice from my father," he said, a process that "should have taken only a few short months has become a years-long stalemate, leaving the British people in limbo." Now, Trump Jr. said, "the clock has virtually run out and almost all is lost — exactly as the European elites were hoping." Trump Jr. did not go into detail on what his father had advised. Asked last year for details by the BBC, May said, with an amused expression: "He told me I should sue the EU. Not go into negotiations; sue them." Donald Trump's #Brexit advice to Theresa May? At a joint press conference with May, Trump said that perhaps she had found his suggestion too "brutal." This week President Trump's former adviser Steve Bannon elaborated on the advice Trump allegedly gave May. "Trump sat there and said 'Listen — No. 1: overshoot the target on your deal because it will come apart,' " Bannon said in an interview with Sky News. " 'No. 2: get on with it — you ought to be on terms agreed within six months; and No. 3: use every arrow in your quiver, even if you have to do litigation later.' "
According to Trump Jr.'s op-ed, "you could say that Brexit and my father's election are one and the same — the people of both the U.K. and the U.S. voted to uproot the establishment for the sake of individual freedom and independence, only to see the establishment try to silence their voices and overturn their mandates." He added: "It appears that democracy in the U.K. is all but dead." The language is undoubtedly "extreme," NPR's London correspondent Frank Langfitt said on Morning Edition, "but some Brexiteers and certainly the far-right press here would largely agree with him." For example, Langfitt said, many people feel that May's most recent proposed deal — which was resoundingly rejected by Parliament — didn't deliver on the referendum of 2016. And talk of a second Brexit referendum "infuriates" Brexit supporters who say that "democracy isn't a best out of three vote," Langfitt said. In contrast, Langfitt said, others in the U.K. are "pretty dismissive" of the op-ed, wondering how Trump Jr. could deign to give Englanders advice given some of the trouble the Trump administration is facing in the U.S. As Labour Party MP David Lammy wrote on Twitter, "Is it a joke?" noting that this is "the same Trump Jr. who met a 'Kremlin-linked lawyer' at Trump Tower in June 2016 after he was promised dirt on Hillary Clinton." Trump Jr. is "no friend of Britain or democracy," Lammy said. Langfitt explained that "while some of the ideas [in the op-ed] would resonate ordinarily, the context and the messenger are probably the problem. This is the son of a president — this is a very strange thing to see, which is not what normally happens in foreign policy." Also, Langfitt said, the idea that people in the U.S. would give advice to politicians in the U.K. when both sides of the Atlantic are at "unprecedented levels of political chaos" doesn't make much sense to people, he said. The U.K. is expected to ask the EU for an extension of the March 29 deadline.